English Tea fans rejoice! I was privileged to be the first customer at a new bakery in Old Town Ramona. The London Bakery 632 Main Street, Ramona CA. I stopped in this morning for one of the best scones I’ve ever eaten…or savored really. Out of the large selection, I chose blueberry. It was light and fresh with the perfect amount of real blueberries. Not overpowering like some, and not dry like most scones in America. Everything is made from scratch by an authentic English baker – and it shows. I’m looking forward to trying more. The tea was Ty Phoo and delicious. It took a hint of milk and sugar perfectly. I’m not sure if it was the tea or the British maker but I will be searching out this one for home use. Love, love, love this place. 3. It makes me happy. The flavor is exactly what it says: Sweet and Spicy, but it’s not too much of either. This tea pairs well with a girl scout trefoil cookie or a fresh sugar cookie. I love that it is caffeine free and needs no added sugar but is not overly sweet. As an herbal tea, it has a rooibos base with a hint of citrus and a nice bite. If you find it too strong, add hot water. If you find it too weak, use two bags and steep longer. Sometimes it’s the little things. The tags always have a cute or interesting quote. Mine says “Every now and then, bite off more than you can chew.” That’s a nice message to start your day. I recently received a generous gift from someone who went to China. It actually came in a beautiful box that was hand carried back to the U.S. This wood case, with custom indents that fit the glass jars perfectly, survived an incredible journey of 6 countries and several modes of transportation only to be dropped by a bell boy in the last hotel. Ugh. Luckily, the tea arrived intact. Technically it’s not really tea. It’s really a miracle golden flower that blooms in some hard to reach region of China for only a few weeks in the spring. According to the Oracle of Truth (Google) it has healing properties like curing cancer, hair loss, acne, depression, and anything else you might have. How do I know this? Because I spent several hours with Google translate, trying to draw chinese characters in that little box, with my mouse, to get one the right one recognized. 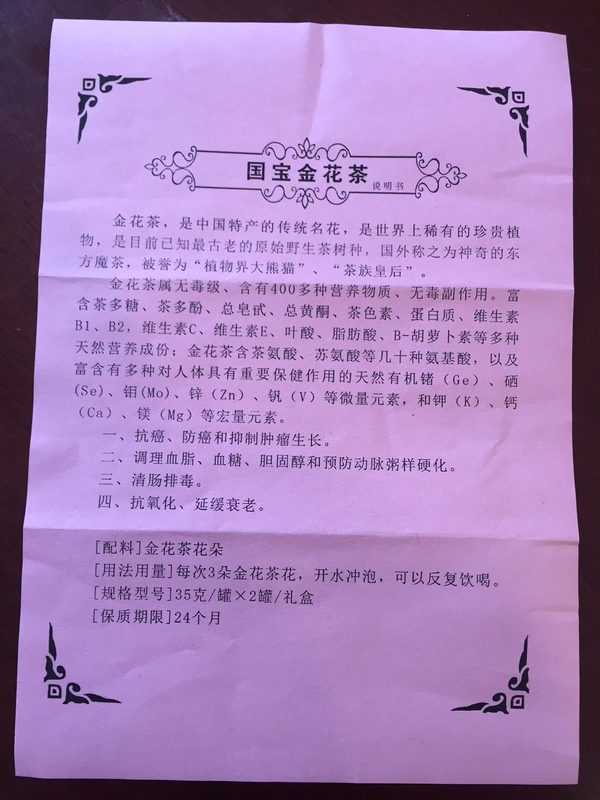 You see, the information and instructions came in Chinese! I managed to get this far: The title line says “Nations (or Chinese National) Golden (or Michael) Flower Tea.” Every time you add a character to the sentence, it can change the meaning of the previous character. Now for the directions. “Add boiling water to three or four flowers.” It took an hour to translate only a handful of words. Never mind, I know how to make tea…..
For an herbal tea, it is similar to a chamomile but not as sweet with an earthy finish that lingers a bit. It is really easy to make. I tried more but found if I put three flowers in a cup, add boiling water and steep for two minutes, it’s perfect. No caffeine means this is a really nice tea at the end of the day. So far, I don’t have cancer, or hair loss so it might be working. Then again, I didn’t have those problems before. The flowers stay in tact so I don’t even strain it. When the tea gets cold or sits too long, it gets a bit stronger, bringing out more dirt flavors. I’ll still drink it but it’s best not to wait long past that sweet spot of perfect tea (not to hot, but not too cold). I am eternally grateful for this gift. Now if I only took advice from my favorite tea cup. Enjoy! If anyone knows Chinese, feel free to translate any warning labels in the comments! I’m not a tea snob, but I know what I like. Recently, I found Mountain Witch Tea company. They are based in Big Bear, California, which is one of the coolest places on earth! It’s a lake and ski resort area in the mountains of California about two hours from L.A. But this is about their tea. 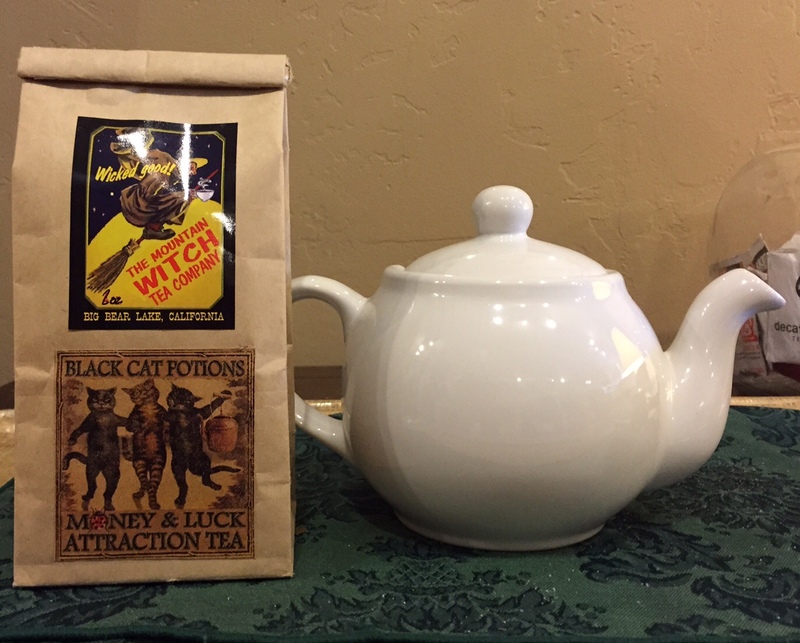 This morning I brewed a cup of Black Cat Potions Money and Luck tea. All their teas are loose leaf and come in a simple bag. Most blends start with a base of black tea with a wide array of herbs, spices, fruit and flowers to give each tea an intoxicating bouquet. With names like Fairy Nectar and Hangover Helper, you can see why these make great gifts. They also have a nice selection of herbal teas without the black tea or caffeine like Sleeping Beauty and Skinny Minny. 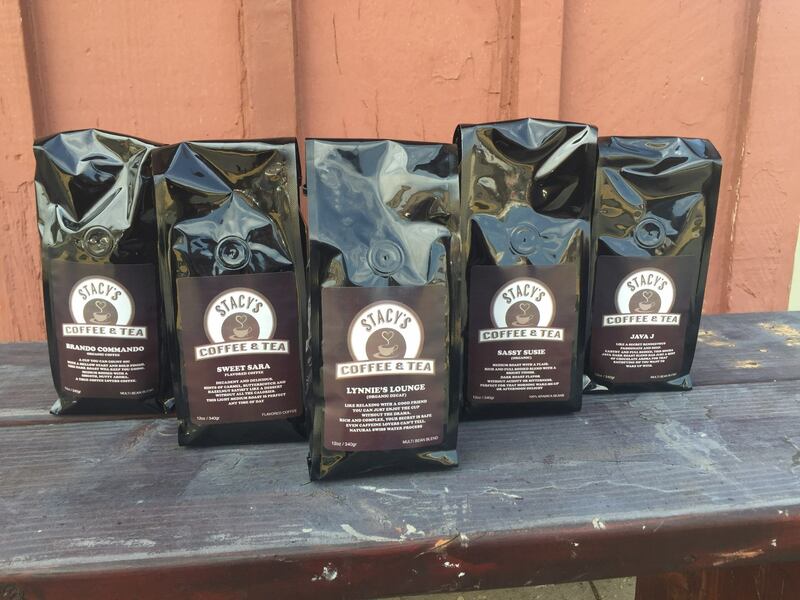 When you open the bag, the aroma envelops you. You can see and smell the complex combination of ingredients. In the pot, the leaves and flowers unfurl. That’s the sign of good tea. At first glance, I thought there may be too many ingredients but they really are blended well. 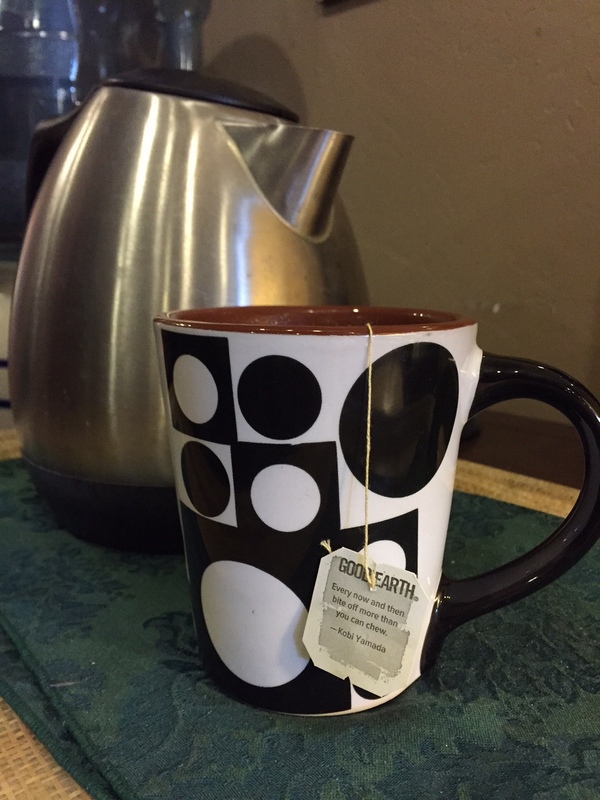 Helpful hint: if you steep too long or use too much, you will really taste the earthiness of the back tea. It’s very strong. It’s well worth paying attention as the reward for watching the steep time is a very yummy tea. The owner suggested you can make it as sun tea or cold steeped to mellow the earthy flavor. I’ve tried some in both hot and cold forms. Most will make a good iced tea with a touch of stevia or honey. I also think the Belgian Dark Chocolate tea may be the cure for PMS. I have started to carry some of these in the shop.